FLAGSTAFF, AZ. 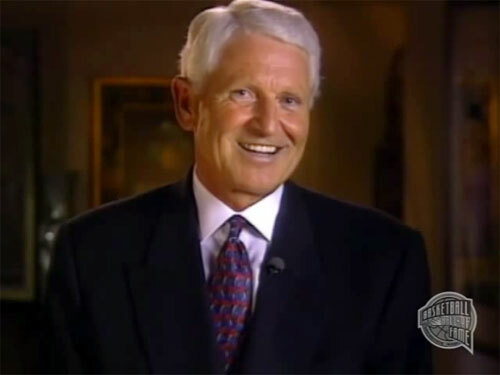 — Lute Olson, the former University of Arizona head coach, has been named the keynote speaker at the Northern Arizona University men’s basketball team’s fourth annual Coaches Dinner on July 30. The dinner will take place at Pine Canyon Country Club in Flagstaff. A meet-and-greet begins at 5:30 p.m. with the dinner beginning at 6 p.m. The dinner will be followed by the two-day coaches clinic on July 31 and Aug. 1, with Oklahoma head coach Lon Kruger and IUPUI head coach Jason Gardner among those scheduled to speak. Source: AZ Daily Sun. The annual Lumberjack Basketball Coaches Clinic began in the summer of 2012 by NAU men’s head coach Jack Murphy and his staff. The clinic aims at providing a platform for coaches to gather together and continue to learn in the game of basketball and leadership. Olson is the fourth coach to speak at the dinner following Mississippi State head coach Ben Howland, Golden State Warriors head coach Steve Kerr and Sacramento Kings head coach George Karl. At the dinner, attendees will be able to hear stories from Olson and participate in a Q-and-A with the former coach. Lute Olson is regarded as one of the greatest coaches in the history of college basketball. He was head coach at the University of Arizona for a period of 25 years. He led the Wildcats to the 1997 national title and four Final Fours. He is one of five head coaches in NCAA history to record 24 or more 20-win seasons. Olson has 46 NCAA tournament wins, one behind John Wooden and one ahead of Bob Knight. His Wildcat basketball teams were wildly popular in Tucson, among university students as well as the general public. Olson brought a renewed sense of prestige to both the University of Iowa and University of Arizona at a time when both of their sports programs were mediocre. Sports Speakers 360 is a booking agent for pro athletes. If you would like to book Lute Olson for a speaking engagement, appearance or endorsement, contact Lute Olson’s booking agent for fees at 1.855.303.5450.